Three young boys become targets of a serial killer. The opening scene definitely sets a tone for the film; it’s extremely gruesome and sets a backstory for the film to run on. What Bustillo and Maury are known for, and do best, is gore and this film includes lots of it - it’s just not spaced out well enough. 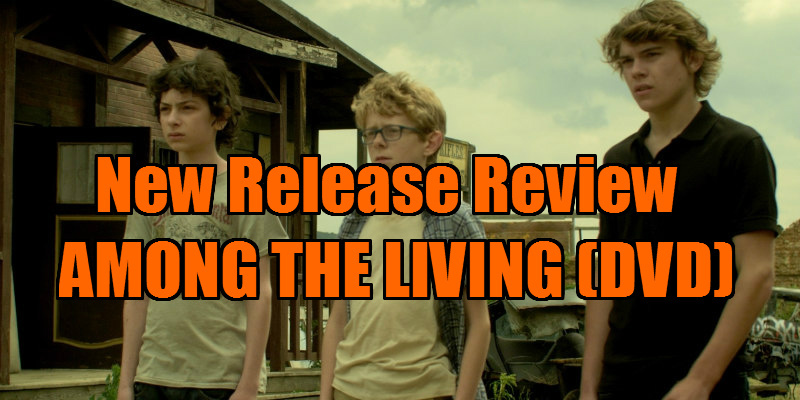 Among the Living is the latest film directed by duo Alexandre Bustillo and Julian Maury (directors of French extremist film Inside). The film follows three adolescent troublemakers (Victor, Tom and Dan) who skip school to go visit an abandoned old film studio; while they’re there smoking joints and being general rebels, they find a woman stuffed in a car boot who is then dragged away by a mysterious man. Of course the three youths are terrified but no one believes them, leaving the killer on the loose and ready to take revenge on the boys and their families. The opening scene definitely sets a tone for the film; it’s extremely gruesome and sets a backstory for the film to run on. The opening third of the film consists of character development to get to know the three main protagonists and their troubles at home, which is extremely essential in a horror film as we need to feel for the characters we are rooting for to survive. It’s extremely light-hearted to start with (opening scene set aside) with inspirational music and sunny skies, but this doesn’t remain for long and the tone drastically changes. One by one, the killer, whose name is Klarence (Fabien Jegoudez), goes to each of the boys' homes and creates havoc. The film rushes these visits; the first two segments are over too quickly and there is no build up here, apart from a couple of horror clichés. The third house Klarence visits is where the film really shines; it takes its time here and exceeds in giving the audience chills and thrills. What Bustillo and Maury are known for, and do best, is gore and this film includes lots of it - it’s just not spaced out well enough. I must say that the film's main killer really freaked me out and sent chills down my spine; his eerie facial expressions and gaunt look is aesthetically pleasing to any horror fan. I think that they’ve got the tone of the film spot on, and I like the fact all of the protagonists are children - there’s just not enough development with the killings and plot for it to astonish me. It’s gory and chilling, but it doesn’t really have a purpose and the backstory is underdeveloped.